This weeks Kink Saturday Selects takes us back to 2015 to check out some raw clips from the Kink In Panama City trip. This raw cut features Sean Sexton, Darryl Tocco, Tony Hamlin, Kazique Ceballos and Dan Coller going to work on spots all over Panama. Needless to say, this was a super productive trip that lead to some heavy clips that are worth revisiting! Check it all out below… After that, you can watch the original Kink In Panama City Trip video here! 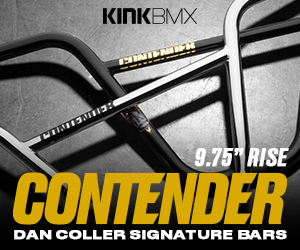 You know you’re in for some real good riding when the Kink BMX team roll into a spot or a skatepark. Ride BMX caught up with a good chunk of the Kink team at a skatepark out in Southern California for a session and here’s a look at a ton of clips they stacked during the session. This is a real good watch from start to finish. “Just a casual day at the park with the Kink BMX squad, but when that literally includes almost the entire squad, things get HEAVY real quick. This was nothing but good times to film and the squad absolutely killed it as expected.. Enjoy, and subscribe. Kink just sent through a raw batch of clips featuring Jorge “Kazique” Ceballos getting loose on a skatepark down in Ecuador. The footage is a little rough around the edges, but Kazique goes big and sends some tricks that you won’t want to miss. Check it out! “Kink World Team Rider Jorge “Kazique” Ceballos sent through some raw footy from a recent trip to Ecuador. Kazique is a lot of fun to watch ride; always going in 100%! Kazique Ceballos has been on it with the videos lately. Here’s his latest from some time he spent over in Quito, Ecuador cruising the skateparks the place has to offer! As always, Kazique throws down with his big bag of tricks and he isn’t scared to send it! Hit play and enjoy! It’s always rad to see what Kink connect down in Colombia, Kazique Ceballos is getting into! Here is his latest video featuring him throwing down at a handful of skateparks and street spots around Colombia, along with some non riding clips giving us a look at what he’s into off his bike as well! Check it out. You should already know there is plenty of crazy riding to take in! “Jorge Arias, trip compiled by different cameras along a journey undertaken by places of Armenia, Quindio and Medellin Antioquia, life is always moving and no place to stay at one time, in one place, in one idea in a single project, fly bro good energy always best to fly to decorate the cage. Kink‘s connect down in Colombia, Kazique Ceballos bringing back the One Hit Wednesday series! This is more than just one hit though, Kazique had to battle it out with a flair on a steep, rough transition (along with a tailwhip fakie) to make this one happen. Check it out! Kink coming through with a BMX video packed full of hammers from the time their team spent out in San Diego recently. Hit play to check out clips from Sean Sexton, Joe Niranonta, Tony Hamlin, Darryl Tocco, Dan Coller, Bob Randel, Kazique Ceballos, Matt Miller, Ben Basford, Travis Hughes, Jacob Cable, Ken Apache, Jake Petruchik and Connor Lodes who all spent some time stacking clips during their stay. This is just one video from a handful of other videos and bike check videos that popped up over the course of their stay. You can check those out in the Kink archives! “The Kink Team spent a month residing in San Diego, California taking in the spots, the sun, good people, and the beach! Stacking a ton of content from livestreams, video uploads, and filming for web parts coming this summer…you can re-visit all the uploads here! Enjoy some unreleased, and some released, footage from The Kink House so far! One of the best parts about BMX is that regardless if you speak the same language, your riding can do all the translating. During the Kink teams stay in San Diego, they invited their international connects Kazique Ceballos from Colombia and Ken Apache from Japan on out to stay with them. Above is a look at all of the crazy footage they collected during their time. It’s safe to say both of these guys took serious advantage of the opportunity and absolutely CRUSHED IT. Hit play! You will NOT be disappointed. “Kink BMX World Team riders, Jorge Kazique Ceballos from Bogota, Colombia, and Ken Apache from Nagoya, Japan had the opportunity to experience America for the first time at the Kink House II in San Diego, CA. Take a look at their take on San Diego’s spots, parks, and random finds! Very little English was spoken, but there was more than enough understanding that BMX can bring anybody together, from anywhere in the world. A culture shock for everyone involved…we were proud to host our International dudes!